Jaw-dropping centerpiece dishes require two essentials: salt and time. Preseasoning is the simplest thing you can do to make a good piece of seafood great. Given enough time to penetrate tissue, salt works flavor magic: It denatures proteins, breaking up their molecular strands into shorter amino acids—among them an abundance of glutamic acid, the essence of umami—to release a complex symphony of savory flavors. Fish, like salmon, only require a short brine because their shorter muscle fibers break down and absorb seasoning more quickly than red meat. Brining also minimizes the appearance of the white protein called albumin that appears on the surface of cooked fish. The added water content helps keep the fish from overcooking, even if it roasts for a minute too long. Combine 8 cups water, salt, and granulated sugar in a deep roasting pan large enough to fit fish; stir to dissolve salt and sugar. Add fish, and let stand at room temperature 1 hour. Remove fish from brine; rinse under cold running water, and pat dry. 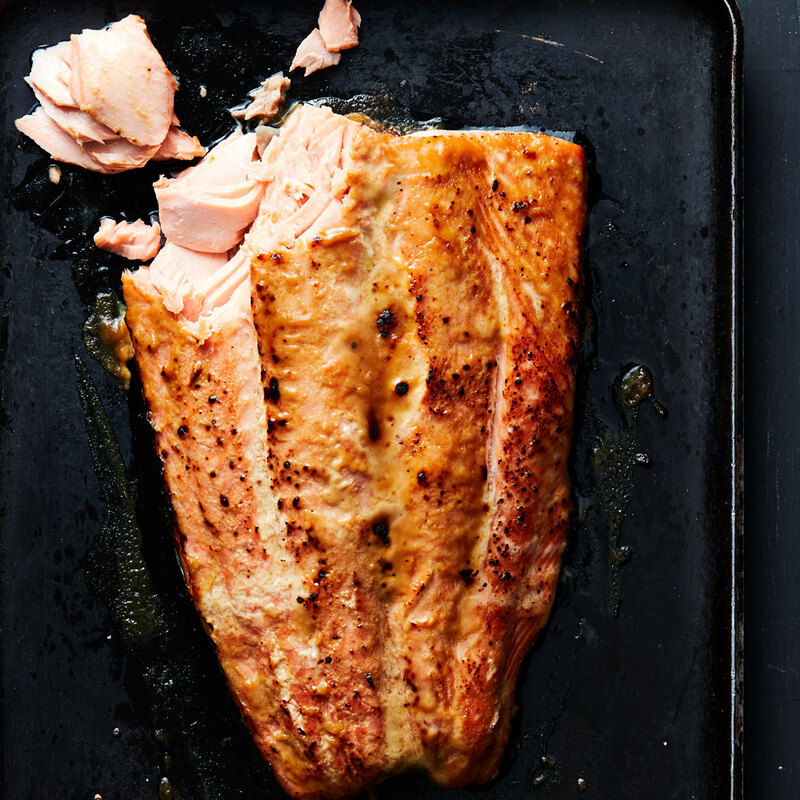 Place salmon, skin side down, on a parchment paper–lined baking sheet, and chill, uncovered, at least 1 hour and up to 3 hours. Preheat oven to 450°F with oven rack in top third of oven. Stir together mustard and brown sugar in a small bowl. Brush glaze over flesh side of fish. Roast in preheated oven on top rack until fish is opaque around edges, about 8 minutes. Turn broiler to high, and broil until fish is cooked through and glaze is bubbly and browned, about 8 minutes. Let stand 5 minutes. Try this method with any 1-inch-thick fillet of flaky fish.